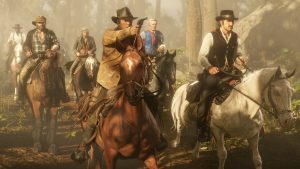 It’s finally time for a review of Rockstar’s Red Dead Redemption 2. Months after release? Such is the life of a gamer with too much going on and yet so much to do within a massive game. Was it worth it? Or was it a chore? It’s ultimately a fair amount of both, depending on how you handle yourself or how much you care. Let’s ride this one out. 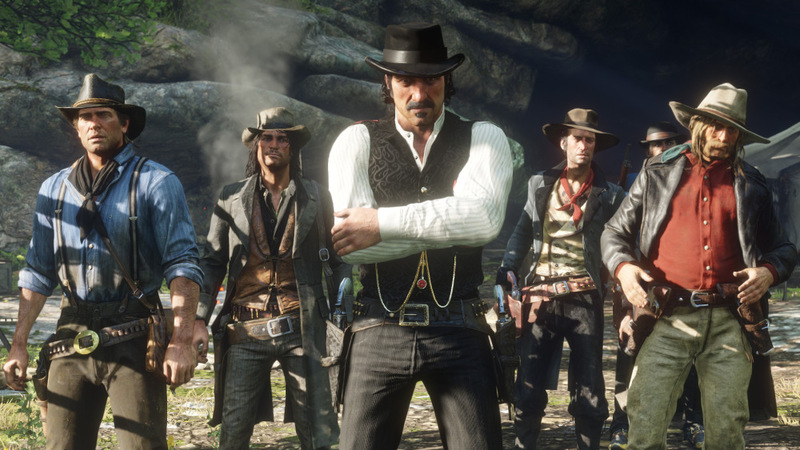 You’re Arthur Morgan, a gunslinging outlaw in a gang under the leader Dutch Van der Linde, who players will likely remember from the original Red Dead Redemption. You’ve served under Dutch for a long time and it’s clear there’s a near father/son relationship there. You’re one of the most respected people from the top, but you have some internal issues with others who are far too intense for Arthur’s mind. Arthur is looking for a way out, maybe. But he deals with his loyalty. Your gang is on the run from a rival gang (and the number grows throughout the storyline) and the law. Ultimately, the world is starting to crush down more and more around gunslingers and outlaws. 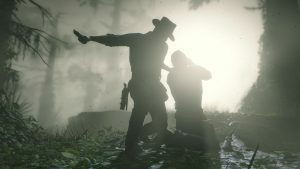 Arthur realizes that more than most and especially more than Dutch. As Arthur, you navigate a variety of challenges and moral ideas that may conflict with the desire to live a peaceful life. But maybe it’s a gunslinging peaceful life. 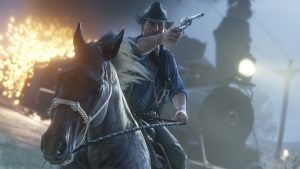 As you might expect, there’s a massive amount of things to do within Red Dead Redemption 2, and in an absolutely beautiful setting. The main storyline itself is lengthy, consisting of several chapters with plenty of missions in each and two epilogues. There are plenty of strangers around towns to help out that can either have multi-part missions or simple one-offs that tend to be repetitive for low-end strangers. There’s a lot of people to meet, horses or trains to ride, hunting, heists, photos, studying, cooking, and resting to be done. The idea is that it’s a large, living and breathing world that allows you to earn money, grab food, and earn products to support yourself and the gang. You’re even expected to donate money and resources to the gang to keep up morale and generate even more resources. I struggled with this element of the game because of how much it can conflict with the main storyline. The main story is incredibly grandiose and tells a relatively deep tale of a group of folks living in a world that very clearly doesn’t want them. They are constantly on the run, attempting to keep their wits and morale about them while quite literally shooting away lawmen who would much rather see them hang. There are temptations and questionable morals that often do a great job of displaying very human issues. Do such trying times show how they can change people? Or were they just that way all along and now they are showing their true colors? I loved the tension that would build between Arthur and some of the gang’s leadership. I loved seeing great connections and bonds created through the tough scenarios they all deal with. And when things are really clicking, you get fantastically choreographed fights, darkened moods, heightened drama, and sweeping, perfect music. Arthur is a great character and often relatable in what he struggles with. But then it all comes crashing down with slog and chores. Sometimes literally chores, as, towards the very end of the game, you’re tasked with completing chores. There’s a lot of busy work to be complete and so much of it early on is unavailable. Or sometimes the pace of the missions or availability of the missions is diluted with quantity. Often, I found myself in a position where I thought I was making solid progress, only to find there were several other missions spaced far enough away from each other to be time-consuming. Concepts like hunting, gaming, heisting, and so on seemed like they would have an impact because of how they are positioned early on but ultimately were able to be skipped in order to save time. I ignored much of the stranger missions, hunting, and heisting because I always had a steady income of food, money, and weapons. Nothing ever really stopped me from progressing. Even the consistent reminders of your health and stamina vitals for you and your horse (and Dead Eye for yourself) never really got in the way, with an exception of in-battle health or Dead Eye. Camp never fell apart due to my inaction. There was always a recharge period. And so that’s the major struggle with the game. Much of it becomes very, very optional. There’s some fun to be had with it for a while. I definitely liked a handful of the stranger missions initially but knew it would just slow down my playtime significantly if I kept going after them for parts three or four. But even while it’s optional, you’re still tied into things and they exist to tempt you into slowing down. Sometimes, it was a random gang attack that would pit me against seven enemies shooting at me simultaneously, so I’d die and have to start over. Other times, it was random strangers trying to engage me or just getting in the way. It all exists just enough to bog down the main story and progress if only to remind you that it’s there. All of this tends to carry over into the online beta, released relatively shortly after the initial. I jumped into online play after I completed the story and just found another delay. I didn’t really get to do much of anything aside from slowly travel around and silently interact with others for a good 30 or so minutes. I was finally able to get into some matchmaking, but the online story exists around it and has you completing both simultaneously. Unlike the main story, this can actually have an impact on how you progress and what resources you have, so there are benefits to completing the story. But, just like the main story, it will significantly slow down your game. The matchmaking itself is relatively quick moving and exciting. The free roam world was more of a crapshoot. You’re certainly better off trying to join gangs to help with your success, but it doesn’t mean you aren’t still left to being randomly shot while you’re trying to review the map. It’s easy enough to jump straight into matchmaking, which I appreciated from the game, but I believe I would have preferred a more traditional online approach over excessive storytelling. It didn’t add much value to the experience for me. If you want to talk about straight play hour value vs what you pay for the game, absolutely! You could sit there all day and live out your Westworld fantasies to the best of your abilities. Notice when this has posted. It will clearly take you some time if you have anything else going on. So in some ways, it’s a lifestyle game. Do you have the time to dedicate to such an involved piece of work? If you want a slow moving and drawn out story, and I very much don’t mean that as an overly negative thing, it’s definitely up your alley. The slow moving and drawn out tendency can work for it in some ways and really hurt it in other ways. Red Dead Redemption 2 is tricky like that. An exciting shootout one moment and scraping up horse manure the next. Such is life. 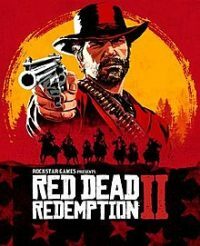 A copy of Red Dead Redemption 2 was purchased by the reviewer and played to main story completion.